Conference of Presidents leaders call for action to root out racism and anti-Semitism following attack in Pittsburgh. Conference of Presidents Chairman Arthur Stark, Executive Vice Chairman/CEO Malcolm Hoenlein and Past Chairman Ronald Lauder travelled to Pittsburgh on Sunday to express solidarity with the Congregation Etz Chayim and the Jewish community there. “We are deeply saddened as we are outraged at the murderous attack at Congregation Etz Chayim, Tree of Life, in Pittsburgh, Pennsylvania. This hate driven murderous assault on innocent people attending a religious service must be condemned by all people who care about our society and country. But words are not enough. There must be concrete action at every level to address the promoters of hate and the sources of incitement to violence if we are to root out racism, bigotry and anti-Semitism, which has increased significantly in recent years. There must be zero tolerance for intolerance. No excuses no exceptions,” the Conference said in a statement. “We salute the first responders and all the law enforcement officers who confronted the killer at great personal risk. We pray for a speedy recovery of the police and worshippers who were wounded and mourn with the families of the victims to whom we extend our sincerest condolences. We stand in solidary with the members of Etz Chayim and the entire Pittsburgh Jewish community,” concluded the statement. Earlier on Sunday, the 11 victims of Saturday’s deadly mass shooting attack were identified. Eight men and three women were among the dead, authorities announced, including 71-year-old Dan Stein, 75-year-old Joyce Feinberg, 65-year-old Richard Gotfried, 97-year-old Rose Malinger, 66-year-old Jerry Rabinowitz, 59-year-old Cecil Rosenthal and his 54-year-old brother David Rosenthal, 84-year-old Bernice Simon, Bernice’s 86-year-old husband Sylvan Simon, 88-year-old Melvin Wax, and 69-year-old Irving Youngner. The gunman, 46-year-old Robert Bowers, was reportedly inside the synagogue for roughly 20 minutes, shooting congregants and guests. Bowers was armed with an AR-15 semi-automatic rifle and several handguns. After 11 people were killed and two others wounded, Bowers exited the synagogue, but was confronted by police officers, who opened fire on him. During an exchange of fire with officers, Bowers wounded four officers on the scene, before he was shot and wounded. Bowers then surrendered himself to police and was placed under arrest. Investigators said they were treating the mass-shooting as a hate crime, and confirmed Sunday that Bowers had made anti-Semitic statements and expressed a desire to massacre Jews during the 20-minute shooting attack. 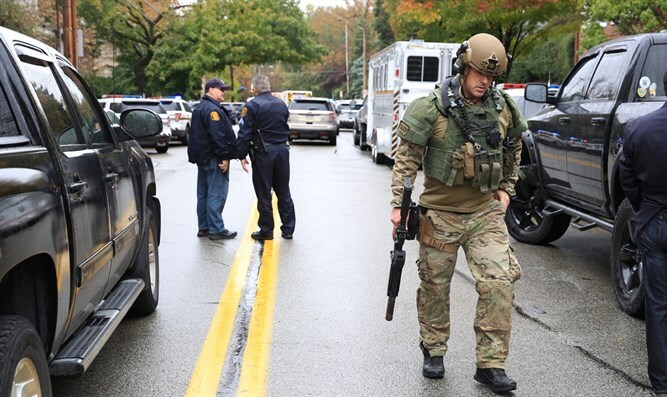 "During the course of his deadly assault on the people of the synagogue, Bowers made statements regarding genocide and his desire to kill Jewish people," US Attorney for the Western District of Pennsylvania Scott Brady said.